Lilabelle Lane: I now own a Staple Gun! I now own a Staple Gun! I know, weird title but I do, I really do! I had to buy one to finish this. For the time being I have decided that it will sit just here. If anyone is interested here are the thread numbers that I used. Not much else happening in my sewing space at the moment. little display with my new cake plate. Love your plate stand. Where did you get your miniture charms from???? your sew laugh love looks fantastic! I love all your lo calorie bakes on your cake stand. I agree with Marina. Your stitchery looks fantastic Sharon. Gorgeous cake display. Can't help you with the jelly roll. I was lucky enough to help Barb destash her one at our last Mill Rosie get together! What a great finish. Sew,Laugh, Love looks great. Sorry I can't help you with the jelly roll. Your stitchery looks lovely in the frame. I like your cake stand. I unwrapped my jelly roll to look at it and it kind of looks like a shed skin from a snake never to be rolled up neatly again. 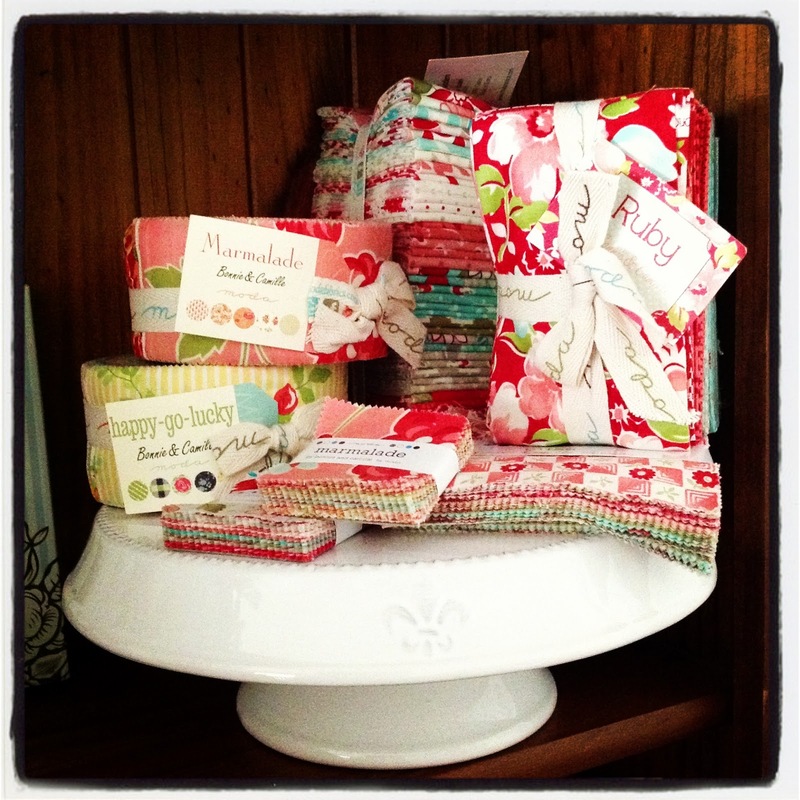 Lovely fabric display and sorry can't help with the jelly roll. Owning a staple gun really improves your life! Love how you finished the stitchery, the pattern on the frame fabric is so neat. Girls love boys toys I think. Lovely finish. A staple gun is a must,no end of jobs can be done around the place. The fabric collection looks very yummy. You could have borrowed my staple gun - I am the Queen of gadgets, lol. Your sew, laugh, love looks fantastic - I might just have to give in and also do one. As for the Ruby jelly roll, I have one but am not ready to part with it, however, if it is still in my stash when I go to the big quilt shop in the sky - it's yours. Sharon. Your stitchery is incredible. Love it. How cute is your 'cake' display. Your Sew, Laugh, Love looks wonderful! Did it feel strange stapling through fabric onto a canvas? I don't have a staple gun but am considering trying one, just not sure about committing to not being able to wash a piece of embroidery/sewing. Geez you finished that fast and isn't it fun stapling rather than sewing binding on! It looks amazing Sharon and you will be amazed how often that staple gun comes out to play too.